We got up about normal time this morning, hooked up and pulled out of the KOA in Oregon about 8:30 AM. We went just a few miles on the interstate and dropped off to go ahead and top off the fuel. While at the fuel stop, Malcolm got an email from WordPress telling him that a comment needed to be moderated for the blog. 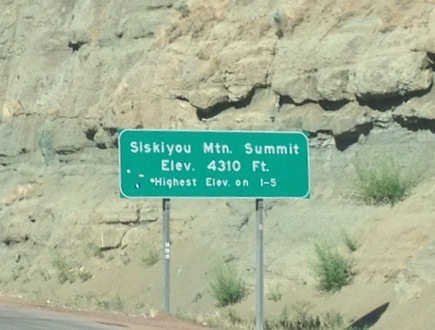 It was from some fellow Heartland owners who follow the blog and passed us on I-5 is southern Oregon (they were heading north, we were heading south). 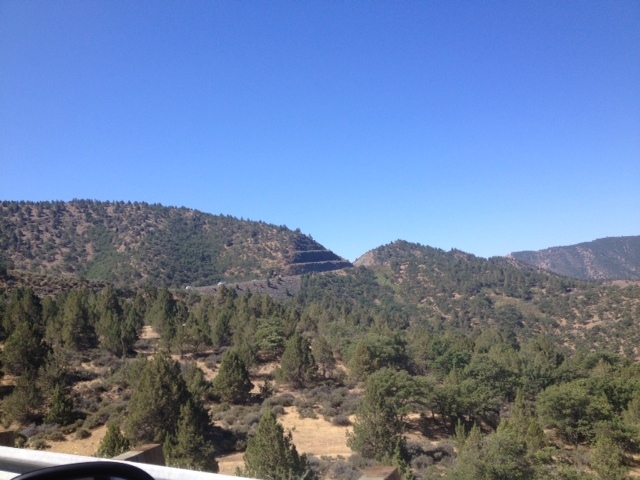 Once fueled up, we did the remaining grind over the mountains through southern Oregon and stopped at the required inspection station. Malcolm rolled down his window and approached the booth. The gentleman there just said “Have a nice day” and waved us on. Pretty simple. 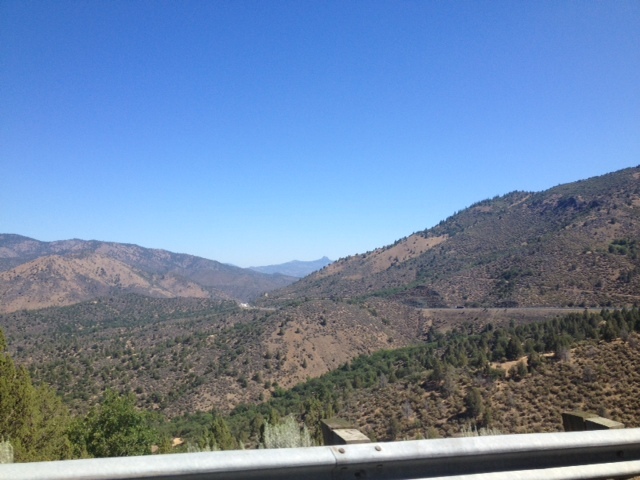 We crossed more mountain passes for quite a while through northern California before it started leveling out later on. There were lots of interesting orchards along the highway. 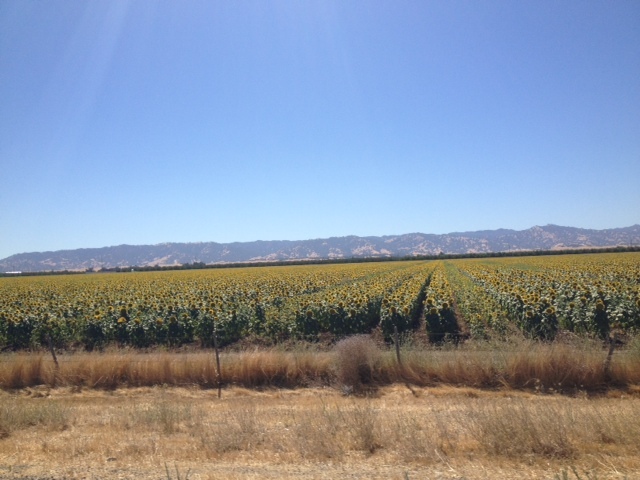 We saw olives, pistachios and sunflowers, among other crops. 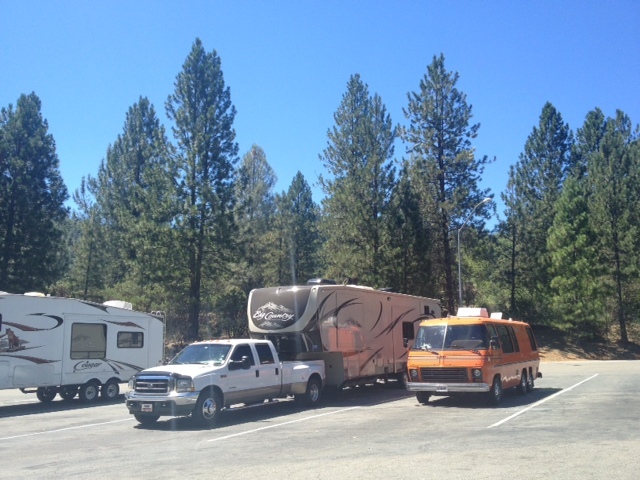 At our lunch stop in a California rest area, we pulled up next to a nice looking mid-70’s GMC motorhome, painted bright orange. 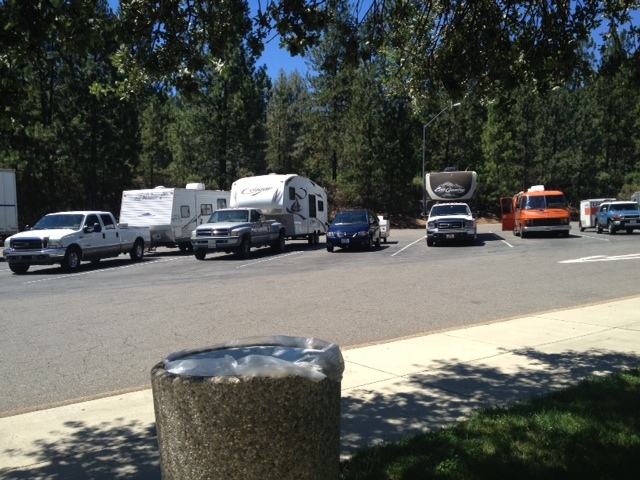 After we started eating, we noticed that the majority of vehicles in the truck and RV section were RVs. 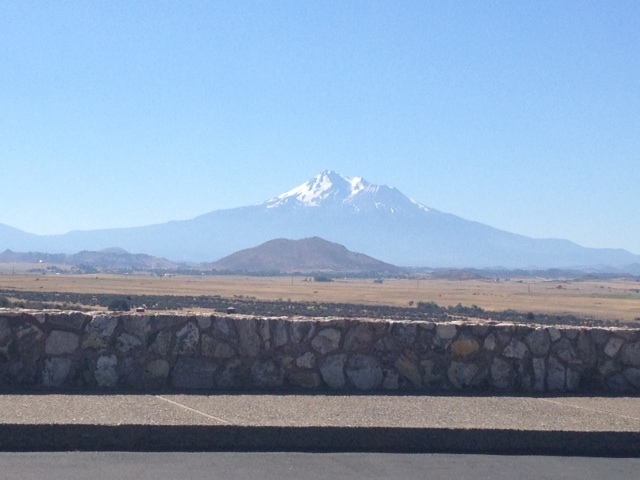 We traveled on south on I-5, picked up the 505 to I-80, then I-80 to 680. 680 runs right by Pleasanton, where we are staying. About 5 miles before we were to get off the 680, traffic ground to a halt. Just as we were slowing for the traffic jam, Malcolm noticed a wide spot on the shoulder and pulled over so we could take advantage of the mobile bathroom behind us. Once underway, it took about 45 minutes to crawl the next two or three miles, then traffic started flowing again. We pulled into the fairgrounds campground about 5:30 PM and checked in at the gate. We went ahead and paid for another day (we had reserved one day’s stay last night via the internet) so that we can spend the day tomorrow sightseeing in San Francisco. Our spot is actually two back-in spots back to back that can be used as one long pull-through. 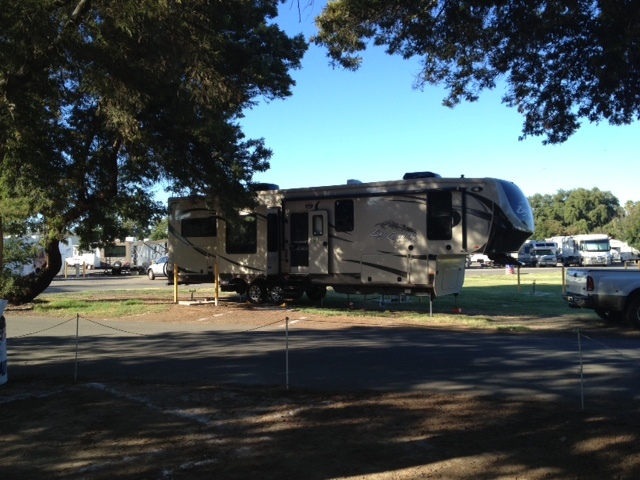 One advantage is that we have one of very few trees in the campground shading the west side (door side) of the trailer. The site was not very level, however. Our leveling system ended up raising both of the off-door side tires completely off the ground (we put plastic blocks under the front and middle jacks on that side to help with the lift). This is where the leveling system shines. 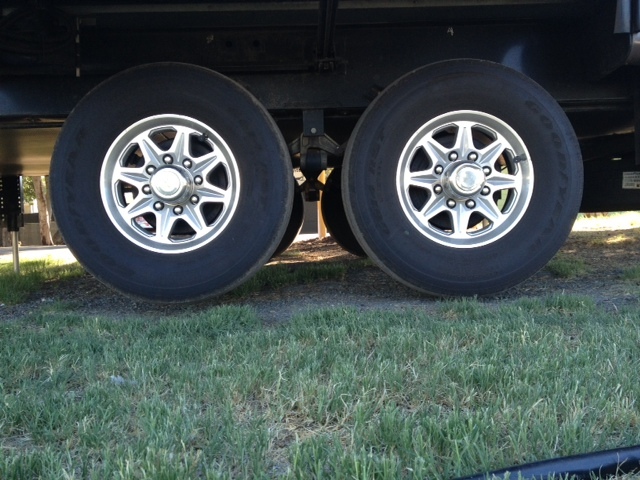 Think how many blocks we’d have to pull up on to in order to level the trailer. 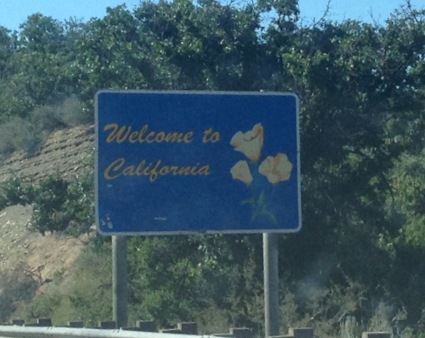 This entry was posted in California, traveling. Bookmark the permalink. Glad you made it to CA/Pleasanton fine. Hope you have an enjoyable visit in San Francisco.